It is hard to believe that I have lived in Brisbane for 15 years and had not visited beautiful North Stradbroke Island. Last weekend I decided to bite the bullet, jump on the car ferry and explore ‘Straddie’ as the island is affectionately known by locals. A very short 45 minutes later and the island was all mine. It turned out to be a great time to visit as the holiday crowds had all left. The RAV didn’t need to leave the bitumen as I made my way around the island from Dunwich to Amity Point, where a few of the local fishermen were dropping in their tinnies, and then on to Point Lookout where I was staying. Every apartment at Samarinda Jewel By The Sea has a view to the ocean so that was a nice surprise. I had forgotten how loud the ocean can be though! It was sobering to see how much of the island had suffered through recent bushfires in December, and how close the fires had come to the township of Point Lookout. On the upside, the burnt areas are now regenerating and are creating a beauty of their own. A highlight on the Straddie trip was my hike out to Blue Lake where I almost tripped over a swamp pheasant who was sitting by the side of the track. At first I thought he was injured, but he was just chilling like a villain and scuttled happily away after eyeballing me for a bit. It is always a wonderful experience to get so close to wildlife in their natural habitat. Another gem of a moment came when I met a pretty spritely old local as I was finishing up a sunrise shoot at Deadmans Beach. He hobbled down the beach on crutches and came towards me with a camera swinging proudly around his neck. He commented on my good choice of camera and told me how he walked this beach every morning, but just not as fast as he used to. He then proceeded to guide my shot and told me to use the log in the foreground. I didn’t have the heart to tell him that I had framed that shot up and had already taken a few shots. The morning light was just gorgeous hitting the rocks. Anyway, I took a further ten shots and then showed him my favourite image on the back of the camera. I waited for the seagulls to mill and a wave in the background to add a bit more interest. He was chuffed and squealed out with delight ‘Wow, you are going to publish that aren’t you”. Well in honour of that fine chap, here is that shot, published in the Getaway Images blog! He also provided me with some good advice and told me that if I came back in a couple of months time, the sand heaped high on the beach by the recent super tides would be gone, and that I would be able to walk right around the point. I think I might just have to visit ‘Straddie’ again and I hope to run into him again. Love salt of the earth people! 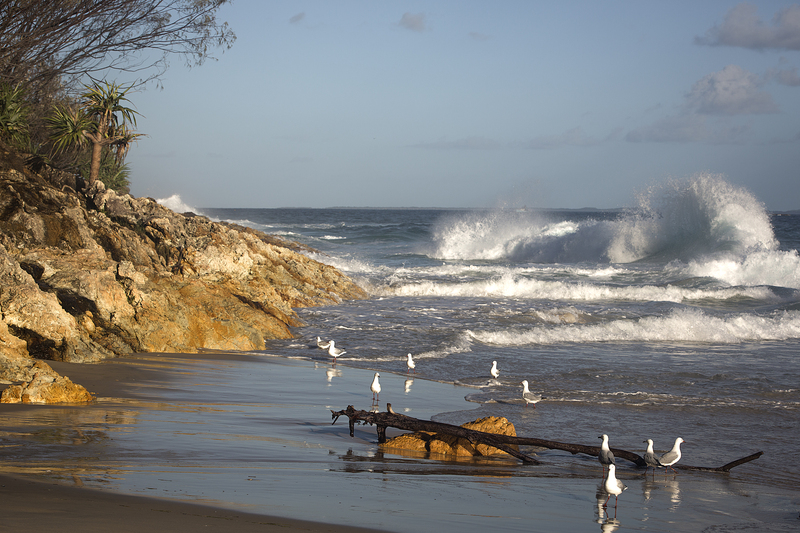 My images from Stradbroke Island will be posted on the website by the end of this month.